Have all the bases covered with the Elements 110mm roller. Roll any cigarette from singlewide to 1½, to king size, this rolling machine can handle it. Whether you have used a roller before or not, the included guide will have you rolling your own cigarettes in no time. These rollers are as durable as they come, being constructed of a tough acrylic rather than flimsy plastic. Single pack not enough? 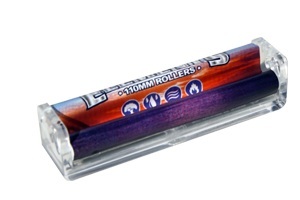 Check out the Elements Rollers 110mm Full Box.